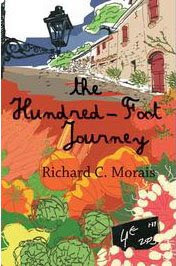 This book may easily have been called the hundred 'food' journey. From the beginning, author Richard C Morais overwhelms your senses with the smells, taste and sights of Indian cuisine which can only be described as cosmopolitan, typical of Mumbai. From then on, it is a gastronomic journey of Hassan, a boy who goes from helping his parents in a roadside eatery to becoming a world-renowned French chef. Surprising as it sounds, the journey is interesting and its characters may be divided into two sets: the boisterous Indians and the reserved French. Hassan is enterprising and learns the very authentic form of French cooking, without any global influences and innovations. Morais works hard, going in detail to describe every dish and every wine. Sometimes, the food overpowers the characters. So, it would help if you are a foodie when you pick up this book. Otherwise, you may not understand this obsession with detail. Also, vegetarians beware, some parts of this book may make you queasy! I would recommend The Hundred Foot journey for an inspirational read into what goes into reaching the top, and the doubts that come with it. It is also about breaking with tradition and following what your heart asks of you.